I received good feedback from the readers on my January 2019 P&S article “Calculating vs. Estimating Pipe Velocity.” Below are some of the letters and my responses. Dr. Nelik, I believe there may be an error in [the article]. 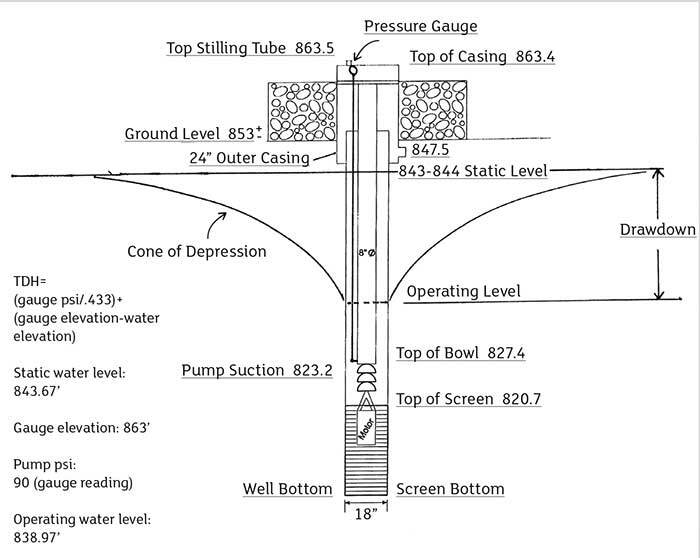 The pump curve shown indicates a service condition of 70 gallons per minute (gpm) at approximately 103 feet total dynamic head (TDH), but your article cites the operating condition at 80 pounds per square inch gauge (psig) with a 5 psig suction pressure. This would be a pump head of approximately 75 psig, or 173 feet TDH, far above the displayed pump curve’s capability. Since the head axis is not labeled, and thinking you may have modified the head axis to reflect psig, I double-checked the brake horsepower (bhp), which checked at 3.31 bhp and, thus, verified the head in feet. As a fellow author, I appreciate when people call me on a mistake or a simple error, and I hope you accept this in the same spirit I intend. Thank you, Ed, you are absolutely correct: I did use the wrong curve. It should be a 1.5 x 1-8 size pump, not the 1.5 x 1-6 the performance of each I showed as an example. Even though this does not change the calculations presented, your observation is very perceptive, and I appreciate you bringing it to my attention. In your January article, the difference that gauge elevation and velocity head contribute to differential pump head was evaluated for a specific example. There was a 9 percent error in the “on-the-fly’’ differential gauge-only head value when compared to the “long-way” calculation for this example. The question, “is this error (9 percent head difference) big and significant?” may depend on the application, actual gauge locations and pipe sizes, and what is done with a gauge-only differential pump head value. The closer the discharge and suction gauge elevations are to being equal, and the closer the discharge versus suction pipe size ratios are to unity, the smaller the error will be between a gauge-only differential head value and the “long-way” calculation. In the article example, if the differential gauge-only head value is taken to be the actual pump head and compared with the pump curve, it might be assumed that this pump was operating far to the right of its intended duty point. If acted on with subsequent system changes, unintended plant and pump consequences could occur. It may be best to treat a gauge-only differential pressure/head value as an approximation, not to be used for system changes. The larger the differential head, the smaller the “long-way” versus an “on-the-fly” head difference will be. If the example pump, with the same gauge locations and pipe sizes, represents one stage performance of a special six-stage pump, the differential gauge-only readings would only amount to an approximate 1 percent error instead of 9 percent. High specific speed pumps typically generate lower head values. Differences in suction and discharge gauge locations in addition to suction and discharge pipe size differences for these pumps could contribute a more significant portion of the actual head value. Taking time to use the “long-way” method might be the better practice and more meaningful for these pumps. Thank you, Lee. I always enjoy your periodic inputs, and you are making an excellent point essentially differentiating between what is actually used—the flow as a base, or the head as a base. If flow is known, and the head is calculated, the impact on an error may be relatively small. But, as you well pointed out, if the calculated head is used to find where pump flow is, the error could be huge, as you also pointed out. Thus, using the calculated head as a way of feedback loop control of the pump flow operation can create an enormous problem. That is because of a generally “flat” shape of the head-capacity curves—making most pumps not advisable to be controlled by the pressure (head) evaluation. Dr. Nelik, as you asked in your January article, here are my thoughts on gauge correction and velocity head corrections. My most extreme example of ignoring the gauge correction occurred years ago at a municipal water pumping station. The customer complained that the new pump was not producing enough pressure. I was sent 500 miles to determine what was wrong. The new pump was located on a lower basement floor and the control room was on the ground floor. For convenience, the pressure gauge was just outside the control room. Because this was before the dawn of the electronics age, the pressure was communicated from the pressure tap at the pump to the gauge via tubing. No one had considered that since the gauge was 30 feet above the pressure tap, a 30-foot “gauge correction” had to be added to the gauge reading. When done, the corrected pump pressure was as it should be. It was a nice, easy trip.